Type of wine: Crisp, medium-bodied dry white. 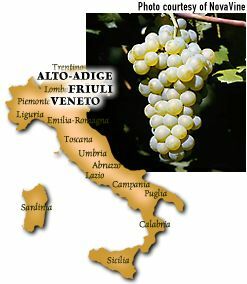 Origin: Believed to have originated in France's Burgundy region, Pinot Bianco has found an important place in northeastern Italy, especially the provinces of Alto-Adige, Veneto and Friuli. Description: Medium straw-yellow in color with a somewhat fleeting aroma of green almonds, Pinot Bianco is medium-bodied with a light fruitiness and crisp acidity. Judicious use of oak adds vanilla and cream tones and imparts a Chardonnay-like texture and finish. Aging: Drink it young and not too cold! FastFoodFacts: Seafood stews, sand dabs, grilled fresh sardines, and sauteed sole. It handles a modicum of garlic nicely. Avoid cheese.